Returning for its fourth time, the Christmas Queens was definitively the kickoff of a very eleganza extravaganza type of holiday season. The two-hour drag queen show took place last Monday (3 Dec), in a very festive Brighton Dome and brought all the noise you can expect from RuPaul’s Drag Race competitors. Not only did the venue look amazing – with all the decoration that December demands – but you could also get yourself all types of seasonal snacks and drinks. The doors opened punctually which gave me time to grab all the mulled wine I could to feel more Christmassy. Bob The Drag Queen (season eight winner) was a fierce host replacing Michelle Visage who couldn’t participate due to her conflicting agenda. 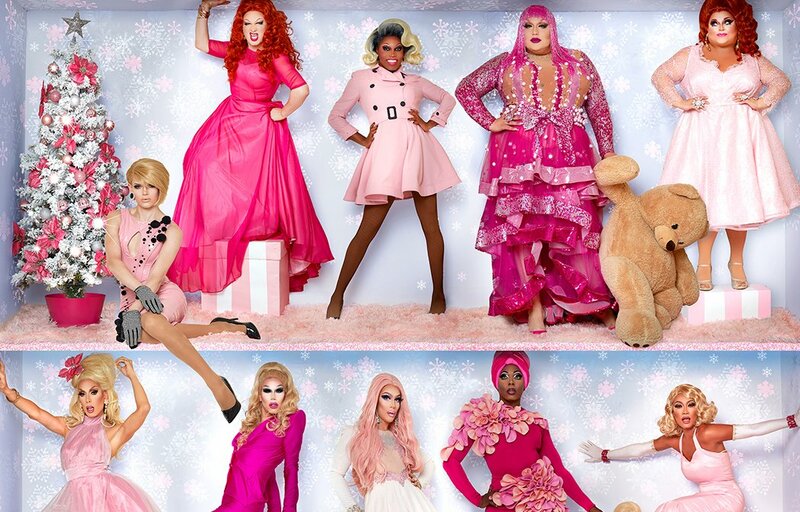 After a short video montage with queens from previous tours, Bob entered the staged followed by Jiggly Caliente (season 4), Asia O’Hara (season 10), Phi Phi O’Hara (season 4 and All Stars 2), Eureka O’Hara (season 9 and 10), Kameron Michaels (season 10) and Sharon Needles (season four winner). All seven queens performed two classic Christmas songs with a gay twist in golden sparkling garments, leaving Bob to open the library with a fantastic session of shade, especially being thrown over Visage and – yes – the audience. No straight man was left alone in the stalls. All queens performed individually with original songs and some parodies; a mix of lip-syncing and singing manage to please everyone who enjoys a good realness. A highlight was Sharon Needles, who didn’t rest on being pretty and sang one of her songs, showing to everyone why she did indeed deserve to win season four. The funniest moment of all was the audience quiz. Not surprising the ones who know what Christmas Queens is about, Bob called 11 people from the crowd and asked questions about all ten seasons of RuPaul’s Drag Race. The winners got “an item from a luxury store: Primark” as quipped by our spectacular host. The Christmas Queens is a must go for the ones who love the show; you will get what you see on TV, charisma, uniqueness, nerve & talent. Previous articleREVIEW: Aladdin, Worthing Pavilion Theatre. No ‘Tragedy’ at all!